Product prices and availability are accurate as of 2019-04-20 04:42:14 UTC and are subject to change. Any price and availability information displayed on http://www.amazon.co.uk/ at the time of purchase will apply to the purchase of this product. 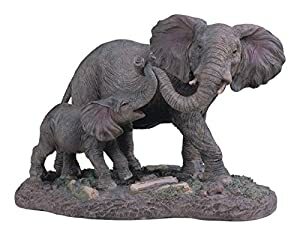 This gorgeous 6.5 inch Gray elephants mother and child playing with trunks Figurine has the finest details and highest quality you will find anywhere! 6.5 inch Gray elephants mother and child playing with trunks Figurine is truly remarkable. 6.5 inch Gray elephants mother and child playing with trunks Figurine details; condition: brand new; item SKU: SS-G-54137; dimensions: H: 6.5 x W: 8.5 (Inch); crafted with: Polyresin.